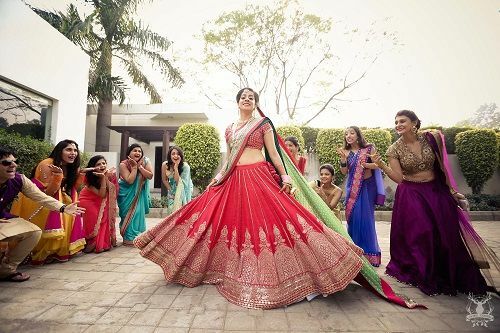 7 Brides Who Wore The Most Gorgeous Red Lehengas - We LOVE! Mints, peaches and beige - brides today are experimenting a whole lot with colours for their wedding outfit. And while we love what we see, it’s no secret that red still continues to be a big favourite! There’s something about the colour, no? Here are 7 brides who wore red lehengas for the wedding ceremony and looked every bit stunning. Major inspiration coming your way! What a sight! Actress Melanie Chandra looks like a vision in this gorgeous red creation. We love the heavy skirt that is paired with a plain sleeveless blouse and blush pink dupatta. Perfect for the summer bride! Image courtesy Melanie Chandra. Photograph by Our Labor of Love. If you don’t want to go all red, then here’s some inspiration. 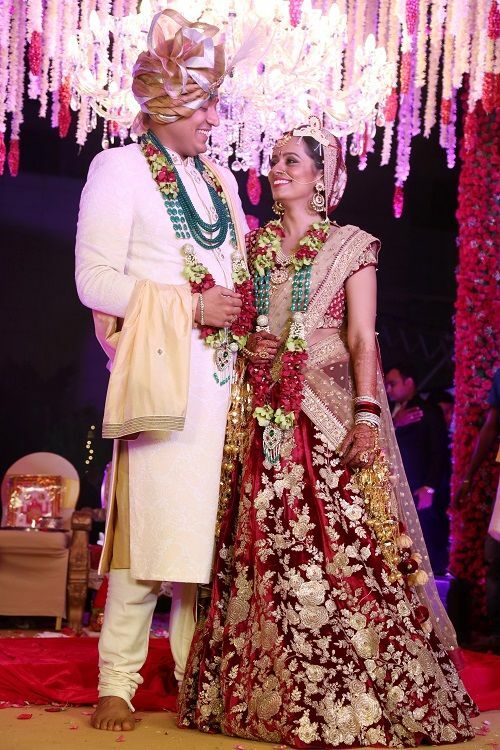 Bride Madhuri wore a stunning red lehenga with double dupattas that had hints of dark and mint green. 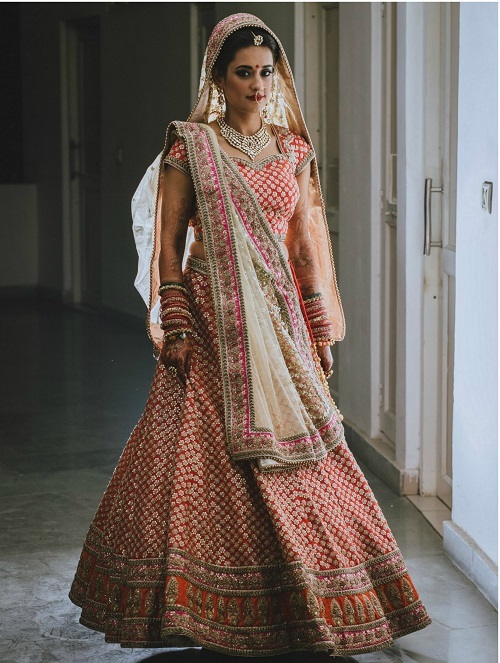 The designer skipped overall work on the lehenga, and kept it light for the day wedding. We love the flare, the green add-on and the beautiful temple embroidery. Image: Morvi Images Also read: 10 Gorgeous Nail Art Designs For All Your Wedding Functions! Want to look like royalty on your D-day? 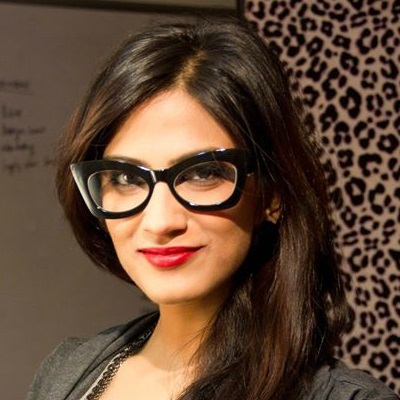 Well, take a lesson or two from bride Richa. Dressed in an elaborate velvet lehenga, she looks every bit the queen. The beautiful and intricate embroidery and the heavy jewellery sure makes her look super special for her big day. Bride Vidisha played with a lot of other colours while letting red take centre stage. From a vibrant orange and pink border to a pretty beige dupatta with hints of pink, we’re loving this creation. Image: Sonder Frames Also read: 7 Brides Who Wore The *Prettiest* Mehendi Outfits – We LOVE! Such a pretty lehenga! And such a unique colour combination. 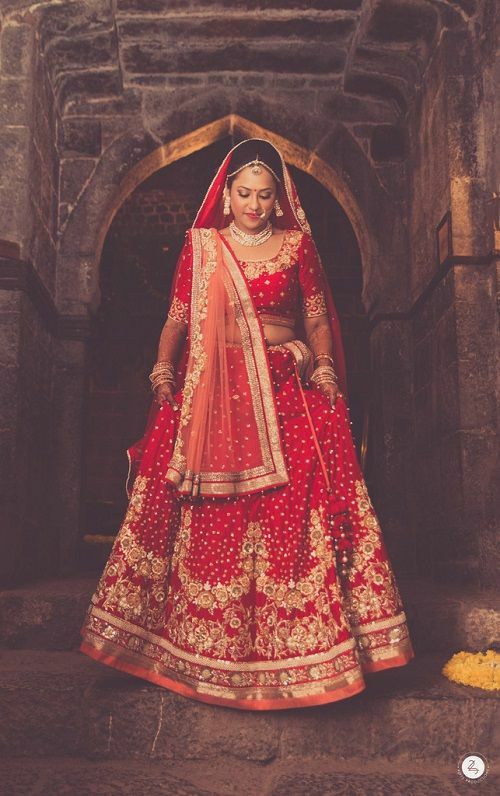 Dressed in a ravishing red lehenga with a peach border and dupatta, bride Chandni looks absolutely spectacular. We love the offbeat design, the colour combination and the freshness of this one! Image: 42fps Productions A place where girls can talk about ANYTHING. (No guys allowed!) ? ? Get the POPxo app NOW on Play Store and iOS App Store.